Prof John G Hughes and Prof Xianyan Zhou sign the agreements with Dr Xinyu Wu, Director of International Development, Bangor & Prof Zhuqing Yang, Dean of Bangor College, China.The first collaboration between Wales and China to establish a new College in China has been celebrated by Bangor University and the Central South University of Forestry and Technology (CSUFT), in China in a signing ceremony at Bangor University attended by both Mr David Jones MP, Secretary of State for Wales, and Mr Guoqiang Li, First Secretary of the Education Section of the Chinese Embassy in the UK. In the exciting new collaboration, both institutions are creating an international college - ‘Bangor College’ which will begin teaching in Changsha City, the capital city of Hunan province in China, and a city with a population of 8 million people. Following more than three years hard work, the two Universities' joint application to set up an international college was approved by the Chinese Ministry of Education in December 2013, one of only two in the UK approved that year. 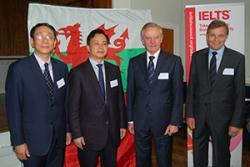 Bangor College China will open its door to 200 Chinese students this September. The College will initially offer undergraduate programme in accounting, banking, finance and electronic engineering, with plans to expand the range of subjects to include other academic areas in which Bangor University excels, such as Forestry and Environmental Studies in a few years’ time. All programmes will be taught and assessed in English, and will provide students with a UK-style higher education experience. Teaching will be delivered by experienced staff from Bangor University as well as newly appointed highly qualified international staff. Students will have the opportunity to study at Bangor University for one or two years. They may also complete the entire programme in China. The College will expand to 2,000 students in a few years’ time providing real opportunities for both Bangor and CSUFT to develop new academic programmes that serve the local social and economic needs. Bangor University’s long-term ambition is also to develop the College into a study abroad centre and a research base for Bangor students to spend 1-2 semesters to study and research in China.